Back in high school, my boyfriend's mother used to serve at her parties Hillshire Farms Lit'l Smokies with this delicious sauce. I loved her recipe and when I asked for the ingredients, she told me it's their official recipe. I loved it so much that she brought it as a dish to our wedding upon my request. For our work Christmas party this year, I combined my meatballs recipe with this delicious Hillshire Farms sauce. Super easy. Enjoy! Two slices of white bread put through the food processor into coarse crumbs. Soak these in milk for a few minutes and squeeze out milk. Mix all the meatball ingredients together thoroughly and form into balls smaller than a golf ball. Place in a 375-degree oven for 30-40 minutes. 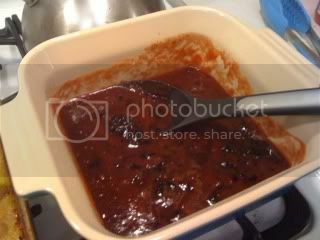 Meanwhile, empty the chili sauce and grape jelly into a casserole dish or crock pot and heat until melted and combined. 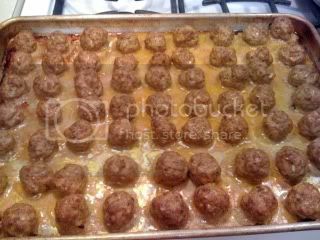 When meatballs are done, place them in the casserole dish and toss till balls are coated with the sauce. Serve with toothpicks at an ugly sweater party.